(NEW YORK) – The Detroit Pistons knew a victory Wednesday night would guarantee them a playoff spot. And, from the opening tip, they left no doubt that was going to happen. 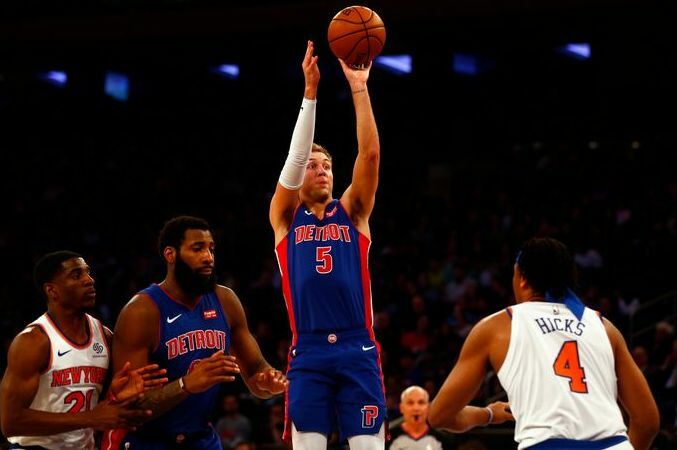 Luke Kennard scored 27 points, Reggie Jackson had 21 and Andre Drummond added 20 points and 18 rebounds as the Pistons locked up the Eastern Conference's final playoff spot with a 115-89 victory over the New York Knicks on Wednesday night. The Pistons will face the top-seeded Milwaukee Bucks in the opening round. The Pistons never trailed and led by as many as 16 points in the first quarter. Detroit extended its lead to 27 points twice in the second quarter and led 65-41 at halftime. The Pistons went up by as many as 36 points and led 92-59 after the third quarter. Detroit took a game-high 40-point lead with 4:31 left in the game. Wayne Ellington added 12 points for the Pistons, who hadn't made the playoffs since the 2015-16 season, the last time they finished over .500 (44-38). Before that, Detroit hadn't made the postseason since 2008-09. John Jenkins led the Knicks with 16 points, Kadeem Allen scored 13 points and Henry Ellenson added 12 points in the loss. The Pistons outrebounded the Knicks 56-33. Detroit has beaten the Knicks seven straight times. They haven't lost to New York since March 27, 2017 (109-95).